56BC. Publius Licinius Crassus, a young man aged about 25, and son of Caesar’s Triumvir colleague Marcus Licinius Crassus, was given a specific task to accomplish while Casesar himself dealt with the Veniti, a tribe which inhabited the area of modern Brittany. Publius was highly regarded by Caesar and also by Cicero, who praised his speaking ability and good character. As a brief aside, young Publius was to die, alongside his father, on the disastrous campaign in 53BC against the Parthians that culminated in the battle of Carrhae. Alongside Publius, one thousand Gallic cavalry also died loyal to their Roman master who had hired them in 56BC. With the task assigned to him upper on his mind, Publius based himself at Tolosa (modern day Toulouse). He knew that the VII Legion was on its way to him but he had authority to augment the force further and to raise auxiliaries to supplement the heavy infantry. A messenger was sent down to Narbo Martius (modern day Narbonne) to raise veterans from this, the first veteran colony established in Gaul, and eventually two cohorts of provincials would join the army at Tolosa. 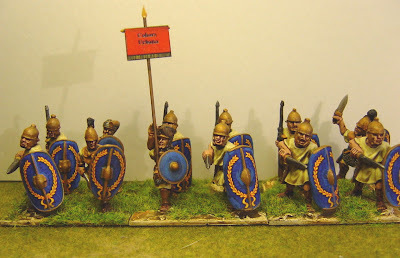 The first cohors urbana of Narbo Martius (figures by Foundry and command by 1st Corps).